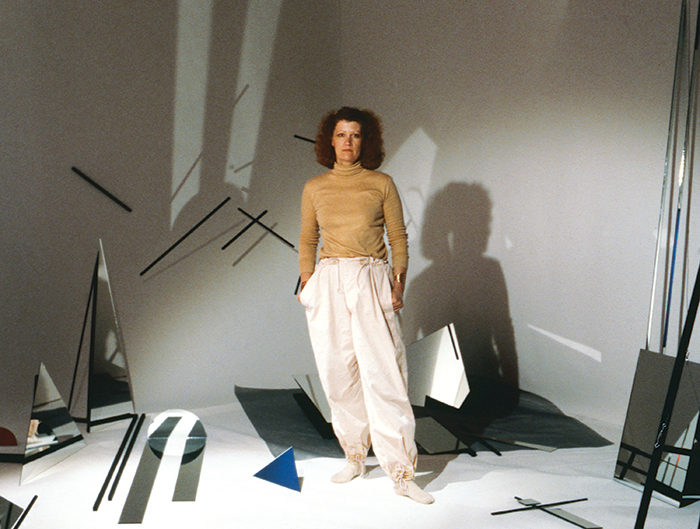 Barbara Kasten at her exhibition “Centric 2: Barbara Kasten, Installation/Photographs,” 1982, Art Museum and Galleries, California State University, Long Beach. 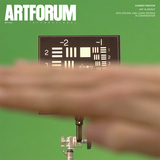 IN AN ARTIST’S STATEMENT written for her 1982 solo exhibition at the San Francisco Museum of Modern Art, Barbara Kasten described her practice as “a specific personal photographic vision with the arrangement of objects as the source,” encapsulating her enduring method over five decades. But it is only with the opening of “Barbara Kasten: Stages” at the Institute of Contemporary Art in Philadelphia that we are able to see all of her major series togetherand understand the extent to which she has gone against the grain of contemporary photography, incorporating the craft and technological tenets of the European avant-garde into her singular exploration of the actual and the optical, the projected and the physical world. Through her exacting considerations of form and process, Kasten constructs work that begets a paradox: It is at once deeply modernist and radically Conceptual.